Grubs are the larvae of various types of beetles, including the May/June Beetle and Japanese Beetle. All varieties of grubs look very similar, with crème colored bodies, brown heads, three sets of legs, and a tendency to curl into a C- shape. Grubs do their damage below the soil surface feasting on grass roots. With no roots left to hold down the turf, dead clumps of grass start to pull up like a carpet. 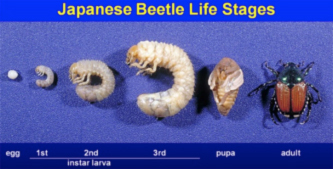 The grubs’ life-cycle stages consist of egg, larvae, pupae, and adult. Japanese Beetles and Masked Chafers have 1 year life cycles, but lawns can have up to 5 generations present at one time. These species mate and lay their eggs in mid-summer, mainly from late June to mid-August. The eggs hatch in 2-3 weeks and the hatchlings begin to feed on fine roots and organic matter. The grubs grow quickly; molting twice and becoming nearly full sized by fall. Vigorous feeding continues until about the time of the first frost, when declining soil temperatures cause the grubs to move deeper into the soil to over winter. In early spring when the soil begins to warm, the grubs move back up to the root zone and resume feeding. When the grubs mature, they stop feeding, move deeper into the soil, and transform into pupae. The new adult emerges several weeks later to complete their life cycle. Damage from grubs usually appears in the late summer/early fall. Symptoms intensify as heat and drought conditions stress the turf. Injury is less apparent during spring because soil moisture is adequate, and the turf tolerates and out grows the loss of roots. The May/June Beetle species take 2-3 years to complete their life cycle, feeding continuously throughout the second summer. These types of grubs can also have up to 5 generations in the lawn at one time. Grubs of species with 3-year life cycles feed throughout the first two summers, hibernating twice. They don’t pupate until midway through the third summer. The adults are usually fully formed by early fall, but the beetles do not emerge from the soil until the following spring. Because of the overlapping generations, and presence of more than one species, it is common to find several sizes together in one property. Regardless of whether the species has a 2-year or 3-year cycle, the greatest damage occurs during the second year. Early detection and proper timing are especially important in prevention and control. The best control and prevention are cultural practices that enhance vigor (irrigation, proper fertilization, higher mowing height) which will help turf to tolerate and outgrow the damage from grubs. 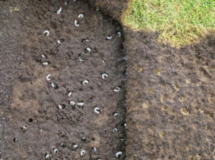 Vigorous turf will often tolerate 5 or more grubs per square foot without visible symptoms, but stressed turf may show damage with half that number. L.C.S. Lawn and Tree Service, Inc. offers control of grubs with 2 applications per year. It can take a couple years of continuous treatments to gain control. Preventative applications in spring will help kill off any new larvae, while curative treatments in the late summer/early fall go after the established grubs. Proper cultural practices teamed up with grub applications will help to keep the population at a point that damage shouldn’t be noticeable. As with any insect 100% control is not possible.